Soy's fabulous crêpe pans with their solid 2.5mm copper mass and silver lining are perfect heat conductors that will give you ultimate control for crêpe-making, omelettes etc. The balance of the pan is just perfect for flipping – suitable for both home use and the professional. The 999 carat silver lining makes the pan able to withstand very high temperatures with ease, unlike their Western-European counterparts, that delaminate (and are lost forever) after roughly 290°C. Produced entirely by hand and hammer cold-forging – no press or even spinning is involved. The handles are of Soy's own patented alloy of sand-cast solid bronze and mounted on the main body with 5 rivets each made of solid white copper, painstakingly filed by hand, and will last a lifetime. The trident handle design means the handle heats up quite slowly, 3 to 4 times slower than cast-iron pans. 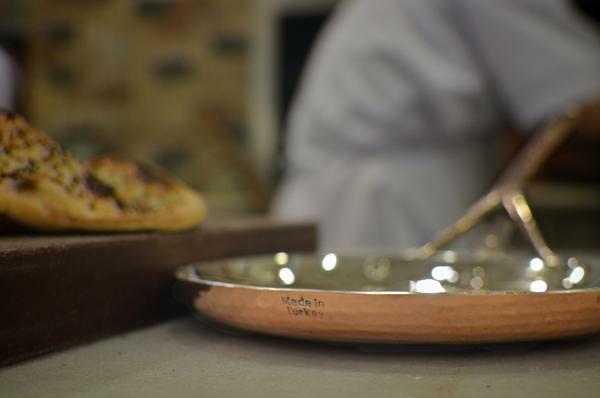 Unlike cast iron and terracotta, which are highly porous materials, copper and silver are totally non-porous and do not require any “curing” or “seasoning”. The pan will retain the heat extremely well, so once the pan is hot, lower the heat during cooking. After use, allow the pan to cool, soak in cold water and wipe clean with a non-abrasive cloth. Discolouration of the metals from use is normal. The pan can be cleaned up with silver polish as desired. It really is exquisite. Love the engraving too, a very lovely gift that will last for ever, and which I can pass down to my children when their turn comes. Custom name engraving (by hand) is available for an additional £15 – just add the Soy Engraving product to the basket and email sales@cornucopia.net with your engraving request (max. 20 characters). Please register the product's serial number on www.soy.com.tr as soon as you receive it in order to benefit from lifetime warranty & free yearly maintenance.